CHOSEN DESIGNS GET APPROVED BY THE STUDIO – AND ARTISTS GET PAID. ALWAYS. Hot Topic and Fan Factory! To enter, submit an original design inspired by the world of Universal Monsters: Dracula, Frankenstein, The Bride of Frankenstein,The Wolf Man, The Mummy, The Invisible Man and Creature from the Black Lagoon. that's not part of this contest! Fans have the opportunity to vote for the design they would most like to buy and wear. Joe is the Senior Buyer of Men's Licensed Apparel for Hot Topic. 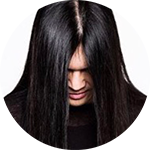 He loves Metal, Pro-Wrestling, and Cats. Mercedes has been with Hot Topic for 14 years and is currently a Buyer for Men's Apparel. She is an absolute fangirl – everything from horror and Harry Potter to Pirates of the Caribbean. In her free time, she is a cosplay extraordinaire. 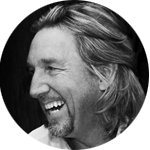 "Crash" McCreery has worked in the entertainment business for the past 24 years and has designed for some of the most prestigious films in the industry. He spent the first 11 years of his career working for Make Up Effects legend Stan Winston as one of his studio's lead artists. He then continued as a freelance creature designer in 2001. His character designs can be seen in such films as the Jurassic Park series, the Pirates of the Carribbean series, Edward Scissorhands, Terminator 2, Ghost Rider, The Relic and many more. He has designed for numerous high profile directors such as Steven Spielberg, James Cameron, Tim Burton, M. Night Shyamalan, Larry Kasdan and Ang Lee. He acted as Gore Verbinski's Production Designer on the live action film, The Lone Ranger, as well as the animated feature, Rango, which earned Crash an Animation Award for best character design and helped Verbinski garner his first Academy Award for Best Animated Film. He's currently working at Universal as the lead designer for all things "Universal Monsters." Create an original piece of art inspired by the Universal Monsters. Explore the full story of the each individual Universal Monster- incorporate secondary characters and environments where appropriate. Stay true to the nature of the characters as depicted in the Universal Monster films. Do not use any 3rd party copyrighted or trademarked content, or inappropriate content, language or imagery. Winning submissions are intended to become officially licensed product. Obscenity and infringement will NOT be considered. Do not submit film stills from the Universal Monsters films. You must create your own original art. Submissions will be accepted for both collective and individual Universal Monsters featured in designs. Refer to the official Rules and Regulations for more information. NO PURCHASE NECESSARY TO ENTER OR WIN A PRIZE. A PURCHASE WILL NOT IMPROVE YOUR CHANCE OF WINNING. ODDS OF WINNING WILL DEPEND ON THE TOTAL NUMBER OF ENTRIES RECEIVED. MANY WILL ENTER, FEW WILL WIN. Universal Monsters Fan Art Contest begins July 20, 2018 and ends August 10, 2018. Must be age of majority or older to enter who, at the time of entry, are legal residents of and are physically located in the United States, the District of Columbia or Puerto Rico. One (1) grand prize winner will win $2,000 and no fewer than three (3) finalists will each win $300. Ten entries per person during the Contest Period. Total ARV of all prizes is $2,900. Void where prohibited. See Official Rules for additional eligibility restrictions and complete details. Sponsored by Hot Topic, Inc. and BoxLunch 18305 E. San Jose Ave, City Of Industry, CA, 91748 United States ("Sponsor") and administered by Fan Factory, ("Administrator"). To see our full set of Contest FAQ, please click here. To see the Official Rules, please click here. Q: I've got a ton of ideas. What are the maximum number of designs I'm allowed to submit? A: Great! But we cap the number of submissions at 10, unless otherwise stated. Q: What file formats should I use when I send my designs over? A: Please use either GIF, PNG or JPG. Q: How large does my high-res art need to be if I am a finalist? A: We're looking for high resolution. 15in by 19in at 300 dpi or as close to it as your art program can handle. If the image is too small, it may hurt your chances of winning. Q: Can I promote myself and send designs to people I know, encouraging them to come to the site and vote? A: Of course! We hope you'll promote yourself like crazy! So by all means let your friends, family and followers know. Q: My design still isn't on the site and it's been more than 2 business days. What's up? A: We review every submission first! Once it's been reviewed, they are made live for viewing and voting. We try our best to review submissions within 2 business days. Note: If you've done any of the following we will not accept the design into the contest and you may not be notified. Your design has inappropriate materials or elements. Your design uses other copyrighted material. This means you are using other people's intellectual property in your design you do not have the right to. No mashups! You've used a design created by someone else as your own. Q: I caught someone breaking the rules. What should I do? A: Let us know. Email info@fanfactoryart.com with details. The more info you can give, the better we can determine how to proceed. NO PURCHASE NECESSARY TO ENTER OR WIN. A PURCHASE WILL NOT IMPROVE YOUR CHANCE OF WINNING. MANY WILL ENTER, FEW WILL WIN. This Contest is intended for viewing and participation only by U.S. legal residents of one of the 50 United States, Washington D.C. or Puerto Rico. Please do not enter if you are not a legal resident of, and not located in, the 50 United States, Puerto Rico or Washington D.C at time of entry. VOID IN THE U.S. VIRGIN ISLANDS AND ALL OTHER U.S. TERRITORIES AND POSSESSIONS, AND WHERE PROHIBITED BY LAW. 1. CONTEST PERIOD: Submissions will be accepted starting July 20, 2018 at 12:00:00 am Pacific Time ("PT") and ending August 10, 2018 at 11:59:59 pm PT (the "Contest Submission Period"). The judging will take place beginning on: August 20, 2018 through August 24, 2018. 1The age of majority is 18 for all states except for: Alabama (19), Arkansas (18 or graduation from high school, whichever is later), Delaware (19), Mississippi (21), Nebraska (19), Nevada (18, or if still in high school at 18, 19 or graduation, whichever comes sooner), Ohio (18 or graduation from high school, whichever comes first), Tennessee (18 or graduation from high school, whichever is later), Utah (18 or graduation from high school, whichever is earlier), Wisconsin (18, or if still in high school at 18, 19 or graduation, whichever comes sooner), Puerto Rico (21). officer, agent, representative, or employee of Hot Topic, Inc., BoxLunch, HU Merchandising, or Universal Studios Licensing LLC ("Licensor") or their respective parents, affiliates, subsidiaries, franchisees, or service agencies (collectively "Contest Entities"); (b) individuals engaged in the development, production or distribution of materials for the Contest or engaged in the administration or execution of this Contest (all such individuals and entities collectively set forth in (a) and (b) hereof referenced to herein as the "Contest Entities"), and (c) persons who are or purport to be immediate family members (defined as biological or step-mother, father, sister, brother, daughter, son, dependent or spouse of any of the foregoing, regardless of where they reside) of any person in any of the preceding categories, regardless of where they live, or who reside in the same household (i.e., live in the same household for at least 3 of the 12 months preceding the start of the Contest Submission Period, whether related or not) as any person in any of the preceding categories. This Contest is subject to all applicable federal, state, and local laws and regulations. Void where prohibited. Licensor is not responsible for the collection, submission or processing of entries, the selection of winners, the provision or delivery of prizes, or the administration of the Contest. 3. HOW TO ENTER: During the Contest Submission Period, enter online by downloading the submission kit and digitally uploading up to ten (10) designs at monstersfanart.fanfactoryart.com. Please click if you would like to download a submission kit. In order to submit, contestants must visit the submissions page during the Contest Submission Period and follow the on-screen instructions to upload their original artwork and complete an official entry form, including agreeing to the terms of the user generated content submission agreement ("Submission Agreement") and click the "Submit Your Design" button to complete the submission form. The uploaded original artwork together with the Submission Agreement and official entry form shall be collectively referred to as the "Entry." All online entries must be received no later than 11:59:59 PM PT on August 10, 2018. Attempts made by the same individual to enter by using multiple e-mail addresses/social media accounts or otherwise will be disqualified. Mass entries, or entries generated by a script, macro or use of automated devices will be disqualified. Winning designs may be used on product and featured in Hot Topic/BoxLunch stores and websites. Must not depict, and cannot itself be in, violation of any law. Must only use the following Monsters. Explore the full story of each individual Universal Monster – incorporate secondary characters and environments where appropriate. Stay true to the nature of the characters depicted in the Universal Monster Films. Design and illustrate around current themes or favorite icons associated with the Universal Monsters, listed in section (r) above. Entrants may only use logos within the design if they are associated with the characters of the Monsters films (ie. Frankenstein logo can be used with Frankenstein). Do not use any third party copyrighted or trademarked content, or inappropriate content, language or imagery. Do not submit film stills from the Universal Monsters films. Entrants must create their own original art. Do not incorporate any other brands or products with Universal Monsters, even if Entrants owns them. Entrant can use iconic features of any characters from the movies, but use of actor images and/or likeness is not allowed. Entries that are not compliant with these submission requirements and/or any portion of these Official Rules are subject to disqualification, at the sole and absolute discretion of the Sponsor and/or Licensor. From August 20, 2018 to August 24, 2018, a panel of qualified judges to include representatives of the Sponsor will judge all of the eligible Entries received during the Contest Submission Period and will select up to one (1) winner and three (3) runners up based on the judging criteria described below. 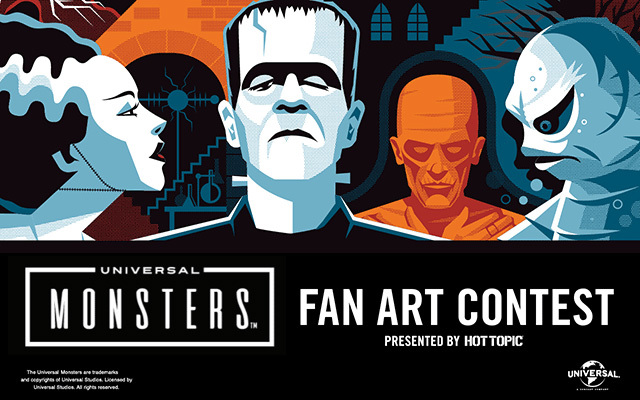 Judging Criteria: (each criterion is followed by its weight in parentheses) submissions digitally uploaded to http://monstersfanart.fanfactoryart.com must depict the character(s) from Universal Monsters. Submission will be judged based on (a) Creativity (25%), (b) Originality (25%) and (c) Fits the Universal Monsters theme (50%). In the event of a tie, an additional, "tie-breaking" Contest Judge will determine the winning Entry based on the criteria listed herein. The grand prize winner and finalists will be eligible to win the Prizes described below subject to verification of eligibility and compliance with these Official Rules. The Contest Judges' decisions shall be final and binding. The Potential Grand Prize Winner may be subject to an interview by the Contest Judges to confirm the eligibility of the Entry, and may be disqualified if the Entry has not complied with these Official Rules, as determined by the Sponsor or the Judges in their sole discretion. Failure to comply with any of these requirements may, at Sponsor's sole and absolute discretion, result in disqualification and the next highest scoring Entry may then be selected by the Judges. 6. PRIZE: One (1) Grand Prize and three (3) runners up prizes are available.. Prize will consist of: One (1) grand prize winner will receive $2,000; and three (3) runners up at $300 each. TOTAL APPROXIMATE RETAIL VALUE OF ALL PRIZES: $2,900. Winners are not entitled to exchange or transfer prizes or to obtain cash or other substitutes, but Sponsor in its sole discretion may substitute prizes of equal or greater value. 7. WINNER NOTIFICATION: Winners will be notified via email beginning on or about October 19, 2018 with instructions on how to be confirmed as a winner and claim their prize. Potential grand prize winner will be required to execute and return an affidavit of eligibility, a liability release, a certificate of authorship documentation assigning all rights, copyright, title and interest in the Entry to Licensor (the "COA"), a W9 form, and, where imposing such condition is legal, publicity release, within the time period specified by Sponsor. Failure to complete and return any of the aforementioned documentation within the allotted time period specified by Sponsor shall result in such Potential Grand Prize Winner's disqualification from the Contest. If a Potential Winner is found to be ineligible or not in compliance with these Official Rules, declines to accept a prize, or Sponsor is unable to contact a Potential Winner within three (3) business days, or in the event that a prize notification or prize is returned undeliverable, the prize will be forfeited and, at the Sponsor's sole discretion, prize may be awarded to an alternate Potential Winner. Potential Winners may be required to furnish proof of identification. If the Potential Grand Prize Winner's Entry is accepted for use by Sponsor and Licensor, such Potential Grand Prize Winner hereby irrevocably, in perpetuity assigns any and all rights to the Entry to Licensor including all copyrights. At the time Potential Grand Prize Winner is notified that their Entry has been selected as the Contest's winning Entry, the Potential Grand Prize Winner agrees to execute such documents as requested of them by (including, without limitation, the COA) to effect/confirm the rights assignment to Licensor. Contest Entities and other participants have access to and/or may create or have created ideas and concepts which may be similar or identical to the entrant's Contest entry materials, ideas and/or concepts. The entrant will not be entitled to any compensation or other consideration because of the use by Contest Entities or any other participant of such similar or identical material, ideas and/or concepts. For good and valuable consideration, the receipt and legal sufficiency of which is hereby acknowledged, each entrant into the Contest hereby irrevocably grants the Contest Entities a non-exclusive, fully sub-licensable and assignable license (but not the obligation) to reproduce, publicly perform, stream, exploit and otherwise use the Entry and any associated materials throughout the universe, in perpetuity, for any reason whatsoever in any and all media, throughout the universe in perpetuity, without further notice to, consent by, or payment to entrant. Without in any way limiting the foregoing, the Contest Entities shall have the right, in their sole discretion, to edit, composite, morph, scan, duplicate, make derivative works of or alter the Entry for any purpose which they deem necessary or desirable, and each entrant irrevocably waives any and all so-called moral rights they may have therein. By participating in the Contest, Entrant agrees to irrevocably and exclusively grant to Licensor all right, title and interest in and to the Entry, including, without limitation, all copyright therein, and the right to perform, market, sell, distribute, produce, reproduce, store, copy, transmit, exhibit, publish, post, edit, adapt, create derivative works from, and otherwise use without limitation the Entry without any further consent or compensation of any nature or kind, in whole or in part, in any manner and media whatsoever (whether now known or hereafter devised) worldwide in perpetuity, for any purpose whatsoever, including, without limitation, for the purposes of advertising, promotion or publicity of "Universal Monsters", or in connection with any merchandising, packaging, subsidiary or ancillary rights, products or materials developed in connection with the "Universal Monsters". Without limiting the generality of the foregoing, Entrants agree that the foregoing grant of rights includes but is not limited to the right of Licensor to use the Entry for any commercial or non-commercial purposes including, without limitation, for use in connection with merchandise without compensation, notice or approval. Entrants agree to waive any and all copyright interest, of any nature or kind, they may have in the Entry, including, without limitation, any moral rights in the foregoing. Winners agree to sign any documents that may be necessary to affect the assignment of the foregoing rights. By entering this Contest, entrants consent to the use of their names, addresses (cities and states), and statements relating to the Contest or Contest Entities, and video clips and photographs or other likenesses (provided by entrant or otherwise captured by Sponsor) without further compensation, notification or permission in any publicity, promotion or advertising carried out by Sponsor, the Contest Entities or any related entities in any and all media now known or hereinafter developed without territorial or time limitation, except where prohibited by law. By entering, entrants (i) acknowledge compliance with these Official Rules including all eligibility requirements and, (ii) agree to be bound by the decisions of the Sponsor and/or Contest Judges, made in their sole discretion, which shall be final and binding in all matters relating to this Contest. Entrants who have not complied with these Official Rules are subject to disqualification, at the sole and absolute discretion of the Sponsor, in which event all Entries submitted by such disqualified entrant will be void. The Sponsor reserves the right to disqualify any entrant's registration in the Contest (and void all associated Entries) or entitlement to a prize, if, in the sole and absolute discretion of the Sponsor, the Sponsor determines or reasonably suspects that the entrant has attempted to undermine the legitimate operation of the Contest by cheating, hacking, deception, or other fraudulent, deceptive or unfair playing practices (including any Entries generated by script, macro, robotic, programmed, or any other automated means). If a dispute arises regarding who submitted an Entry, the Entry will be deemed to be submitted by the authorized account holder of the email address provided at time of Entry and must comply with these Official Rules. "Authorized account holder" is defined as the natural person who is assigned to an email address by an Internet access provider, online service provider, or other organization responsible for assigning email addresses for the domain associated with the submitted email address. As a condition of entering, entrants (or their parent or legal guardian if an eligible minor) agree: (a) to release Sponsor, Contest Entities, Administrator, Licensor, each of their affiliates, and each of their officers, directors, employees and agents, from any and all liability, loss or damage incurred with respect to participating in the Contest or the awarding, receipt, possession, and/or use or misuse of any prize or any travel related thereto. Any controversy or claim arising out of or relating to the Contest shall be settled by binding arbitration in a location determined by a single arbitrator as set forth herein (provided that such location is reasonably convenient for claimant), or at such other location as may be mutually agreed upon by the parties, in accordance with the procedural rules for commercial disputes set forth in the Commercial Arbitration Rules of the American Arbitration Association ("AAA") located at www.adr.org. The judgment upon the award rendered by the arbitrator may be entered in any court having jurisdiction thereof. The arbitrator shall be selected pursuant to the AAA Rules and Procedures. The arbitrator shall apply the laws of the State of California consistent with the Federal Arbitration Act and applicable statutes of limitations, and shall honor claims of privilege recognized at law. In the event that the claimant is able to demonstrate that the costs of arbitration will be prohibitive as compared to the costs of litigation, Sponsor will pay as much of the claimant's filing and hearing fees in connection with the arbitration as the arbitrator deems necessary to prevent the arbitration from being cost-prohibitive. If any part of this arbitration provision is deemed to be invalid, unenforceable or illegal (other than that claims will not be arbitrated on a class or representative basis), or otherwise conflicts with the rules and procedures established by AAA, then the balance of this arbitration provision shall remain in effect and shall be construed in accordance with its terms as if the invalid, unenforceable, illegal or conflicting provision were not contained herein. If, however, the portion that is deemed invalid, unenforceable or illegal is that claims will not be arbitrated on a class or representative basis, then the entirety of this arbitration provision shall be null and void, and neither claimant nor Sponsor shall be entitled to arbitrate their dispute. Upon filing a demand for arbitration, all parties to such arbitration shall have the right of discovery, which discovery shall be completed within sixty days after the demand for arbitration is made, unless further extended by mutual agreement of the parties. The prevailing party shall be entitled to an award by the arbitrator of reasonable attorneys' fees and other costs reasonably incurred in connection with the arbitration. THE ARBITRATION OF DISPUTES PURSUANT TO THIS PARAGRAPH SHALL BE IN THE ENTRANT'S INDIVIDUAL CAPACITY, AND NOT AS A PLAINTIFF OR CLASS MEMBER IN ANY PURPORTED CLASS OR REPRESENTATIVE PROCEEDING. THE ARBITRATOR MAY NOT CONSOLIDATE OR JOIN THE CLAIMS OF OTHER PERSONS OR PARTIES WHO MAY BE SIMILARLY SITUATED. DO NOT ENTER THIS CONTEST IF YOU DO NOT AGREE TO HAVE ANY CLAIM OR CONTROVERSY ARBITRATED IN ACCORDANCE WITH THESE OFFICIAL RULES. BY PARTICIPATING IN THE CONTEST, EACH ENTRANT AGREES THAT TO THE EXTENT PERMITTED BY APPLICABLE LAW: (1) ANY AND ALL DISPUTES, CLAIMS AND CAUSES OF ACTION ARISING OUT OF OR CONNECTED WITH THE PROMOTION, OR ANY PRIZE AWARDED, WILL BE RESOLVED INDIVIDUALLY THROUGH BINDING ARBITRATION AS SET FORTH ABOVE, WITHOUT RESORT TO ANY FORM OF CLASS ACTION; (2) ANY AND ALL CLAIMS, JUDGMENTS AND AWARDS, INCLUDING WITHOUT LIMITATION LEGAL CLAIMS, COSTS, INJURIES, LOSSES OR DAMAGES, DEMANDS OR ACTIONS OF ANY KIND (INCLUDING WITHOUT LIMITATION PERSONAL INJURIES, DEATH, DAMAGE TO, LOSS OR DESTRUCTION OR PROPERTY, RIGHTS OF PUBLICITY OR PRIVACY, DEFAMATION, OR PORTRAYAL IN A FALSE LIGHT) (COLLECTIVELY, "CLAIMS"), WILL BE LIMITED TO ACTUAL THIRD-PARTY, OUT-OF-POCKET COSTS INCURRED (IF ANY), BUT IN NO EVENT WILL ATTORNEYS' FEES BE AWARDED OR RECOVERABLE; (3) UNDER NO CIRCUMSTANCES WILL ANY ENTRANT BE PERMITTED TO OBTAIN ANY AWARD FOR, AND ENTRANT HEREBY KNOWINGLY AND EXPRESSLY WAIVES ALL RIGHTS TO SEEK, PUNITIVE, INCIDENTAL, CONSEQUENTIAL OR SPECIAL DAMAGES, LOST PROFITS AND/OR ANY OTHER DAMAGES, OTHER THAN ACTUAL OUT OF POCKET EXPENSES), AND/OR ANY RIGHTS TO HAVE DAMAGES MULTIPLIED OR OTHERWISE INCREASED; AND (4) ENTRANT'S REMEDIES ARE LIMITED TO A CLAIM FOR MONEY DAMAGES (IF ANY) AND ENTRANT IRREVOCABLY WAIVES ANY RIGHT TO SEEK INJUNCTIVE OR EQUITABLE RELIEF. SOME JURISDICTIONS DO NOT ALLOW THE LIMITATIONS OR EXCLUSION OF LIABILITY, SO THE ABOVE MAY NOT APPLY TO EVERY ENTRANT. 9. The Official Rules and the Contest are governed by US law and are subject to all applicable federal, state and local laws and regulations. All issues and questions concerning the construction, validity, interpretation and enforceability of the Contest Official Rules, or the rights and obligations of entrant and Sponsor in connection with the Contest, shall be governed by, and construed in accordance with, the laws of the State of California, U.S.A., without giving effect to the conflict of laws rules thereof, and any matters or proceedings which are not subject to arbitration as set forth in the above of these Official Rules and/or for entering any judgment on an arbitration award, shall take place in the State of California, in the City of Los Angeles. 10. Sponsor reserves the right in its sole discretion to cancel, modify or suspend this Contest at any time if fraud, technical failures, including any network server or hardware failure, viruses, bugs, errors in programming, or any other errors or other causes corrupt the administration, security, integrity or proper play of the Contest and, if cancelled, at Sponsor's discretion, to select the Winners from all eligible entries using the procedure outlined above. 11. Sponsor and the Contest Entities do not warrant that access to the Contest will be uninterrupted. Sponsor and the Contest Entities are not responsible for any problems that may arise, including but not limited to; (a) lost, interrupted, inaccessible or unavailable networks, servers, satellites, Internet Service Providers, Websites, or other connection, availability or accessibility problems arising in connection with or over the course of the Contest; or (b) communications failed, jumbled, scrambled, delayed, or misdirected computer, telephone or cable transmissions or hardware or software malfunctions, failures or difficulties; or (c) failure of personal computers and/or software and hardware configurations, any technical malfunctions, failures, or difficulties, printing errors, clerical, typographical or other error in the offering or announcement of any prize or in any prize notification documents; or (d) for any other errors of any kind relating to or in connection with the Contest, whether human, mechanical, clerical, electronic, or technical or otherwise, including, without limitation, any errors which may occur in connection with the administration of the Contest, the processing of registrations or entries, the uploading of submissions, the judging of entries, the tabulation of scores, the announcement of the prizes or in any other Contest-related materials; or (e) the incorrect or inaccurate capture of information, or the failure to capture any information in connection with the Contest; or (f) damage to a user's computer systems, networks, or data occasioned by participation in this Contest or downloading any information necessary to participate in this Contest. 12. Any attempt by an entrant or other individual to deliberately damage any website or undermine the legitimate operation of this Contest, including but not limited to any fraudulent claims, is a violation of criminal and civil laws. Should such an attempt be made, Sponsor reserves the right to seek remedies and damages from any such individual, to the fullest extent permitted by law, including criminal prosecution. Entrant engaging in any of the foregoing activities may be disqualified, will forfeit any prize(s) won, and all associated Entries and/or scores will be void. 13. In the event of any conflict with any Contest details contained in these Official Rules and Contest details contained in contest marketing materials, if any, (including but not limited to point of sale, television, and print advertising, promotional packaging, and other promotion media), the details of the Contest as set forth in these Official Rules shall prevail. 14. The invalidity or unenforceability of any provision of these Official Rules shall not affect the validity or enforceability of any other provision. In the event that any provision is determined to be invalid or otherwise unenforceable or illegal, these Official Rules shall otherwise remain in effect and shall be construed in accordance with their terms as if the invalid or illegal provision were not contained herein. In particular, Sponsor's employees are not authorized to waive, modify or amend any provision or provisions of these Official Rules in any manner whatsoever. 15. This Contest is solely sponsored by Hot Topic, Inc., 18305 E. San Jose Ave, City Of Industry, CA, 91748 United States and Administered by Fan Factory. 16. For any legally required notice of the Prize Winner, send a self-addressed postage stamped envelope to: Universal Monsters Fan Art Contest – Winner List Request", 18305 San Jose Ave, City of Industry, CA 91748, to be received by December 31, 2018. Winner's notice will be sent after all prizes have been awarded. 17. Odds of winning depends on the number of entries received, and the judged level of creativity, originality and relevance, per the judges' criteria, of the entry submission. 18. To see how we use personal information obtained in connection with this Contest, please visit http://www.boxlunch.com/customer-service/privacy-policy/ or http://www.hottopic.com/customer-service/privacy-policy/ Personal information may be collected, used or disclosed. Neither Sponsor, Administrator nor Contest Entities will sell, share or otherwise disclose personal information of entrants with third parties or agents, other than to third parties or agents engaged by Sponsor to fulfill the above purposes or as permitted or required by the applicable laws. If you are selected as a winner, your information may also be included in a publicly-available winner's list. Q: How many designs can I submit? A: You can submit up to 10 designs unless otherwise stated. Q: If I am a finalist, how large does my high-res art need to be? A: We recommend that your file is done 15in by 19in at 300 dpi or as close to it as your art program can handle. High resolution is key! If the image is too small, it may hurt your chances of winning. 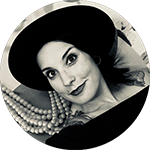 Q: Is it ok for me to promote my designs to people I know, encouraging them to come to the site and rate them? A: Yes! We encourage every artist submitting to the contest to promote themselves and their designs to friends, family and followers. Go ahead and promote yourselves like crazy! Q: I see people cheating. What should I do? A: Please email info@fanfactoryart.com detailing what you are suspecting. The more details you can give, the better we can make our decision.